Hello friends, we know mobiles are important part of our life. With the help of mobile we can communicate with each other. Before few years you will be able to send or receive calls and sms to another person via mobile. But, today billion of persons use latest technology smartphone. Today we have to discuss how to unlock pin pattern lock password on Android device. These smartphone has different important features. You can easily do your important job work, instant chat, send audio, video message to others. These features are very helpful for the users. But sometime we fell trouble due to these features. Today we discuss about an important topic pin or pattern locking features. With the help of this feature you can easily protect your data with unwanted persons. But sometime we forgot about the pin or pattern locking password. In that situation you will be disturb and take your phone to mobile service center to reset the password. But most of the time your important data will be lost during resetting the password. Today we discuss how to unlock pin pattern lock password on Android device without data lose. We are human and it’s not easy to remember each and everything. Most of the person forgetting the pin or pattern locking password.If anybody forgot his pin or pattern locking password and try to unlock. Then after reaching the number of attempts your phone will be permanent locked. Most of the knowledgeable person use Factory Reset option to overcome this kind of problem. But in Factory Reset option you will lose your important data. 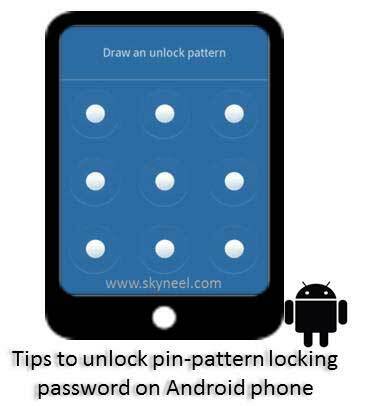 So, today we will discuss about a quick and easy use simple tips and trick from which easily unlock pin pattern lock password on Android device without data lose. Step 1: First of all install your Android Device USB drivers on your PC, If you don’t your device USB driver then Click here to find. 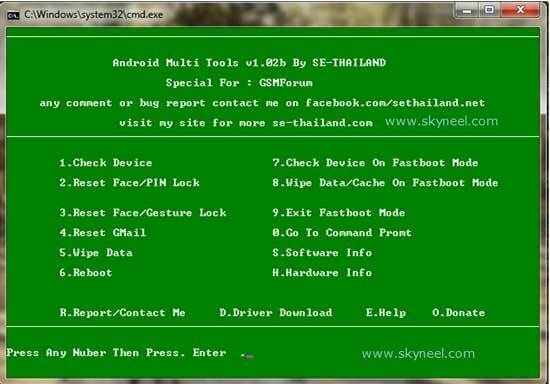 Step 2: Now, download on the third party tool which name is Android Multi Tool click here to download. and extract this tool on your desktop. Step 3: Now open this Multi Tool folder and run Android Multi Tools v1.02b.exe file. Then connect your android device with the help of USB cable. Step 5: Here you will get list of different options. You can choose any required option as per your need. If you want to reset face or pin lock then press 2. If you want to reset face or gesture lock then press 3. Step 6: After choose and press required option press the enter key. After that your device will be reboot. that’s all. When your android phone is reboot your pin pattern locking password will be reset without any data lose. I hope you like this article. After reading this article you will be able to easily unlock pin pattern lock password on Android device. Your data will be safe during this procedure. Kindly share your knowledge with your friends, family members and others. Thanks to all. Good stuff about the pin protection. Please keep on posting these type of articles.